Let me share what I believe is one of the most dangerous doctrines being taught today–the “sovereignty of God”. Now, don’t tune me out. I believe God is sovereign, and that he is our Supreme Ruler, but most people today have a wrong understanding of God’s sovereignty. Here’s why I believe this is so dangerous–it pushes us into passive Christianity. You see, if God’s in control, then we don’t have to do anything. And, why pray? Why pray for something that goes against God’s will? We just live our passive lives and God will do whatever he wants to. Here’s what I think happened (and I’m the first to confess). We pray. We ask God for something hard, but the answer doesn’t come, so we stop praying. We reason in our mind that God must have something else in store–you know, the big picture. And so, we come up with a human reason why we didn’t get our answer, and this is often the reason: it must be God’s will, or God is sovereign. So, we bring God down to our understanding, to our level of reasoning. We say, “These must be God’s thoughts and God’s ways. Surely, this must be what he’s thinking.” Yet, God clearly tells us, “My thoughts are not your thoughts and my ways are not your ways” (Isaiah 55:8). Here’s my doctrine on God’s sovereignty: “God is good. The devil is bad.” That’s it! Pretty deep, isn’t it? Good things are from God, and bad things are from the devil. 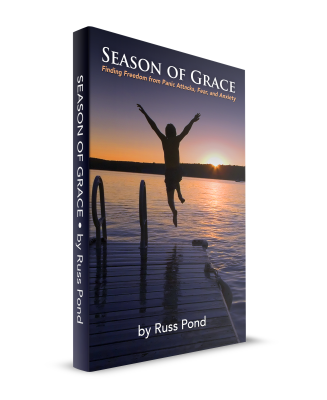 When Susan loses her baby, it’s not God causing that to happen. It’s the devil. He hates you. He spends every minute of every day trying to destroy you. Remember, he’s the one who comes to “steal, kill and destroy. Jesus came that we might have life, and life more abundant” (John 10:10). Panic attacks do not provide an abundant life; therefore, they are not from God. He’s not the author of panic, fear and confusion. These come from the devil. And, many times, some of these things are the consequences of our own decisions. If you keep eating junk food everyday, then you can only blame yourself for clogged arteries. If you drink three cups of coffee a day, work from sunrise to sundown, and never slow down, then don’t blame God for the anxiety and stress. Many times, it’s the fruit of our own decisions. The way God’s sovereignty is being taught today is dangerous, because it pushes us into passivity. If God’s in control, then I can’t change anything. Prayer is useless and there is no need for faith. But that’s just not true. You see, “without faith [without believing], it’s impossible to please God” (Hebrews 11:6). We must believe that our prayers make a difference. We must believe that God is on our side, and that he’s fighting for us. We must believe that we can stand up to the enemy in the righteousness and authority of Jesus Christ. We are conquerors. We are victors. We are children of the most-high God! Prayer: Proverbs 3:5 says, “Trust in the Lord with all your heart, and don’t lean on your own understanding.” Father, too often, we’ve leaned on our own understanding. We’ve reasoned in our hearts why things happen the way they do. But, today, I pray that you would open my heart to the truth. Show me how I can be active in this Christian life, and make a difference for you.